"+" Ride to Design Museum at new location in Kensington. Report and photo on the Southwark Cyclists web site. Thanks to Jane for leading. Route at http://gb.mapometer.com/cycling/route_4497331.html. ﻿Or gpx to right. Canada Water to Dulwich Park and back. March 11th, 10am to 12 noon. 20 people riding in lovely spring sunshine on a repeat of ride on June 11th last year (see report). Outward route: railway paths (NR425), Bridgehouse Meadows, Brimington Park, Peckham Rye Park. Reached Dulwich Park almost exactly on time (11am). Shock to see the Pavilion Cafe boarded up and a large truck depositing cement. A temporary cafe has been bolted on the front - I was worried for a moment that the denizens of Dulwich might be having to go without there latte in the park! Note, the separate loo block was not boarded up and was open as usual. Return route: Crystal Palace Rd, Peckham Square, top section of the Canal Path. We diverted to the south end Glengall Rd due to the work on the wall at the end of the Canal Path. Path is due to re-open at the end of March. Final stretch took us through Southwark Park, then back at Canada Water about 5 to 12. So steady pace had been maintained with us covering 11 miles. Route at https://goo.gl/IWkKmN. Canada Water to the O2. March 4th, 10am to 12 noon. 21 riders ready for the challenge of 19km to the O2 and back. Off we went about 5 past 10 on a bright morning heading around Greenland and South Docks and along the Thames Path to Greenwich. Then on round the Greenwich Peninsula still following the Thames Path until we reached the point where the path is blocked due to all the development going on on that stretch. Diverted onto the horrid dual-use pavements alongside the traffic heading to the Blackwall Tunnel, then back on to the Thames path next to the O2. Sadly that was as far as we went. Complex puncture delayed us. In the end dispatched the group homeward with Philippa and Amanda leading while David and I plus 3 others put a new inner tube of the wrong size into Belinda's bike. Our small group then set off, but the air was slowly seeping out of a dodgy valve, so David diverted and guided Belinda to a nearby bike shop to get a correct size inner tube fitted. The remaining 4 riders headed back homeward. When I reached Canada Water it was 12.15 and no-one around. Then the main group appeared having cycled back at our usual modest pace. So we did not quite make it to the Ecology Park, but there was a useful demonstration of bike survival skills. And a lesson on why we recommend that everyone carries a spare inner tube, in good condition, that fits their bike. Route at https://goo.gl/d7Tr4C and as gpx below. Not sure I will attempt this part of the Greenwich peninsula again until the Thames Path is open. The pavements on the diversion route are covered in litter of all sorts. 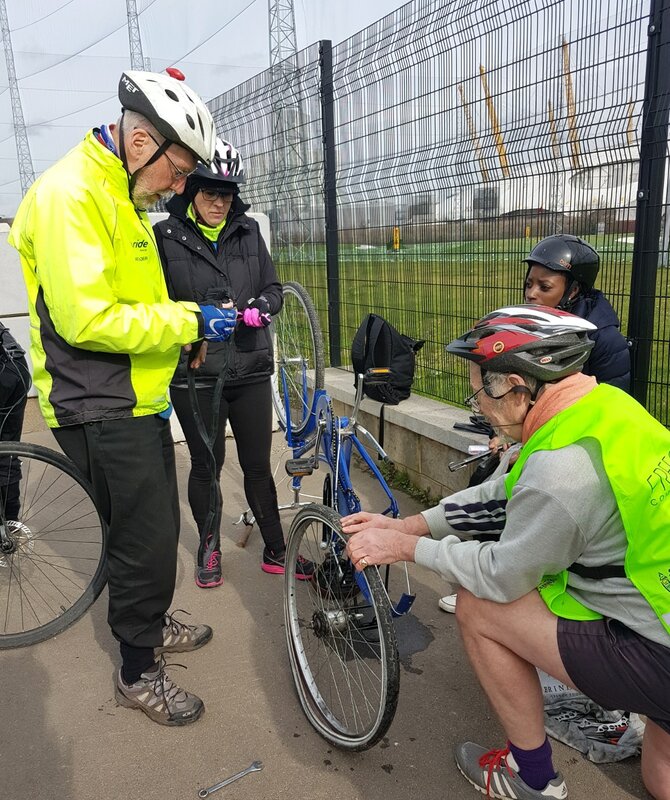 21 cyclists is 42 wheels, all at risk of picking up a sharp object like the small shard of glass we removed form the punctured tyre. Grey morning with some very light rain about. Nevertheless, 17 riders (plus a small rider in a trailer) set off from Peckham on a near repeat of the ride on Nov 26th 2016 (see Report). Headed up through Peckham Rye Park then down to Ewhurst Rd (LCN22) and into Ladywell Fields. Turned north on National Route 21 and soon came to the complex circular foot bridge over the railway. Most walked the bridge, but a few managed to ride. Ladywell Park Cafe closed after a recent break-in. But had time to stop at the Delice Cafe and Cafe Oscars in Ladywell Rd. Returned via quiet roads to Brockley Rd, then LCN22 to Peckham Rye Park. Time for a quick loop into the Park before negotiating Rye Lane back to Peckham Square. Thanks to Amanda for leading and Philippa for the photos. Lovely, almost spring-like, morning, so not surprisingly a good turnout of 19 riders, including several new faces. Set out at 9.35 from the Park Life Cafe in Burgess Park across the park then north to Quietway 1. At Southwark Bridge Rd turned right on to Cycle Superhighway 7 and then after the bridge, left on the the E-W Superhighway. At Blackfriars crossed a low barrier on to the northbound slip road. This is now modified for the Tideway works but was not officially open. So a tiny traffic free segment of route! Up the N-S Superhighway to Holborn Viaduct where it runs out. Continued onside streets to Clerkenwell Rd at Hatton Garden. First of several problematic road works! Clerkenwell Rd being resurfaced with no access to Eyre St Hill. Diverted west and rejoined route at Sidmouth St. Along the lightly segregated Tavistock Place, now a permanent scheme (thank you Camden Council). Eventually made it to Regents Park pretty much on time and a stop at the cafe on Chester Rd. Next to Hyde Park via York Place (crossed Marylebone Rd on foot), then back streets including Crawford St (where a striking church whose name no-one knew was spotted, subsequent research reveals its identity, see photo, and Connaught Square. As planned did the loop of North and West Carriage Drives (including a section of new cycle path, part of E-W CSH) and Rotten Row ending up at Hyde Park Corner (see photo). Then down Constitution Hill and long the Mall. As usual pulled off on to the north side path/road but what a mistake! Full of tourists and obstructed by endless trucks belonging to a film crew, we were severely held up. Should have stayed on the road where traffic was light.... Round Horse Guards, then more road works in Gt George St (but must not complain, I think these are improving the E-W CSH). Approaching Westminster Bridge were behind time, so decided to go directly towards the Elephant via Westminster Bridge Rd. Alas, a huge crane was doing its stuff on Westminster Bridge Rd and had caused a big traffic jam that was very difficult to pass. However, once through we made steady progress back via Kennington Rd, the E+C south-west bypass and Portland St. Back at Chumleigh Gdns at 1pm as planned. Route at https://goo.gl/ZjwqlF or gpx file on right. Snowing at 10am, and for a bit before. Only light snow, but with temperature only just above freezing was not the best attended ride of the year! Undaunted, 6 of us set off across Southwark Park on an outward leg that took us over 2 zig-zag bridges (at Oldfield Grove and at Elverson Rd DLR Station). Up Morden Hill (warmed us up a bit) and on to Blackheath. Made good time - was too cold to hang about. Down through Greenwich Park and along improved path beside the railway to Greenwich DLR Station. Found the hanging bicycles (see photo) marking the start of Quietway 1. In fact they predate Q1, possibly (David speculates) left over from 2012 when a cycle cafe was at that location during the Olympics. Headed back along Q1, skipping the diversion to Deptford Market Square. At the end of Childers St left Q1 and headed north to the river. Thence back to Canada Water along the river and round South and Greenland Docks. Still snowing, so the survivors headed rapidly homeward maybe thinking of log fires and mugs of cocoa. Route at https://goo.gl/2iMwBA or gpx file for download on right. Feb 4th 2017. Just 9 riders on a cold, wet, grey February day. Started with the preferred route between the 2 regular start points for Southwark Healthy Rides, Peckham Square and Canada Water Library. At Canada Water Library just missed the planned meet up with 2 riders. By now the rain had stopped. Followed the Albion Channel to Surrey Water and the Thames. Then around the Thames path to Durrants wharf. Discussed the proposed foot/cycle Brunel Bridge to Canary Wharf, now under serious consideration. Would certainly open up some excellent route options! Next through Russia Woodland to Greenland Dock. Stopped as planned at the Sustrans Memorial Bench that commemorates Barry Mason, the founder of the Southwark Healthy Rides. Finally back via an alternative route from Rotherhithe to Peckham that uses sections of Quietway 1 and Nat Route 425. Into Peckham Square with a few minutes to spare and the now the sun was out. Route at ﻿https://goo.gl/EikJ0i﻿. Out and back ride to Look Mum No Hands, one of the original cycle cafes. 21 riders despite a heavy shower just before the start. 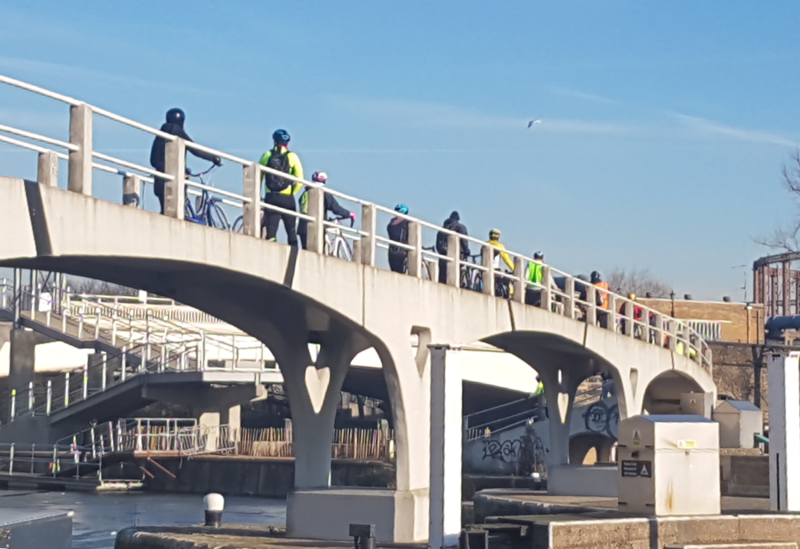 With Amanda leading we headed for Burgess Park with a detour as the north end of the Canal Path was blocked off. Then across the park, along Walworth Green Link, back streets to CS7 and Southwark Bridge, quiet roads across City, past the Barbican, to Old St. Not really time for coffee, but we had one anyway. Fortunately service at LMNH is commendably swift. Having nicely warmed up headed back the same way. Quicker return run, so only about 12.10 when back at Peckham Square. Total 10 miles, route at goo.gl/OpBXma. Very cold bright morning. Twenty riders for the first "+" ride of 2017, including several new faces. Some ice about so we were going to need to be vigilant. However along the Thames route to Greenwich we did not encounter any problems. At the foot tunnel met Nigel with another group about to set off. And we were joined by Philippa. Through the foot tunnel and around the riverside path on the Isle of Dogs. Negotiated, without getting lost, the tricky route from Stewart St, where we left the Thames path, to the Limehouse Cut at Mallory Close. The underpass at Aspen Way/Blackwall Station is not very beautiful, but it does the job. Traffic on the A13 was light, so the right turn into Chrisp St was negotiated without too much stress. At the Limehouse Link one rider headed home as had become very cold - you really do need the layers on a January morning with the temperature just above freezing. 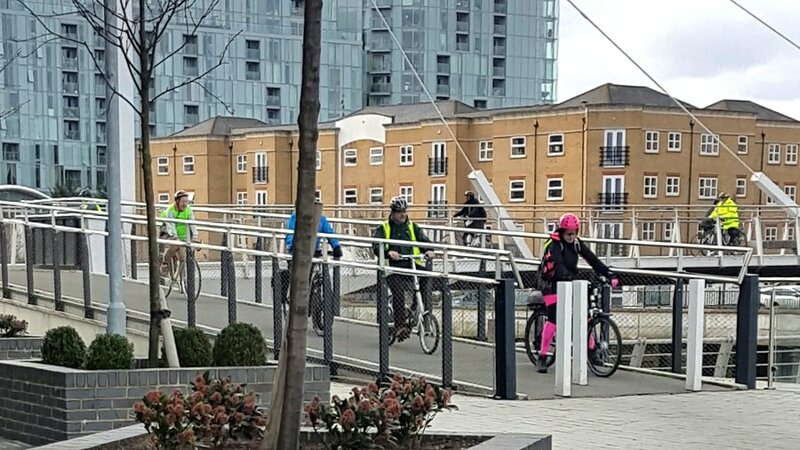 However 3 more riders joined over the next stretch along the towpath of the Lee Navigation, past 3 Mills and into the Olympic park close to the London Stadium. Some slippery stuff on this stretch, but only one coming off. This was on the exit from the boardwalk at the end of the Limehouse Cut where the metal section was extremely slippery. But no harm done. Peckham to Greenwich via Telegraph Hill. First ride of 2017. 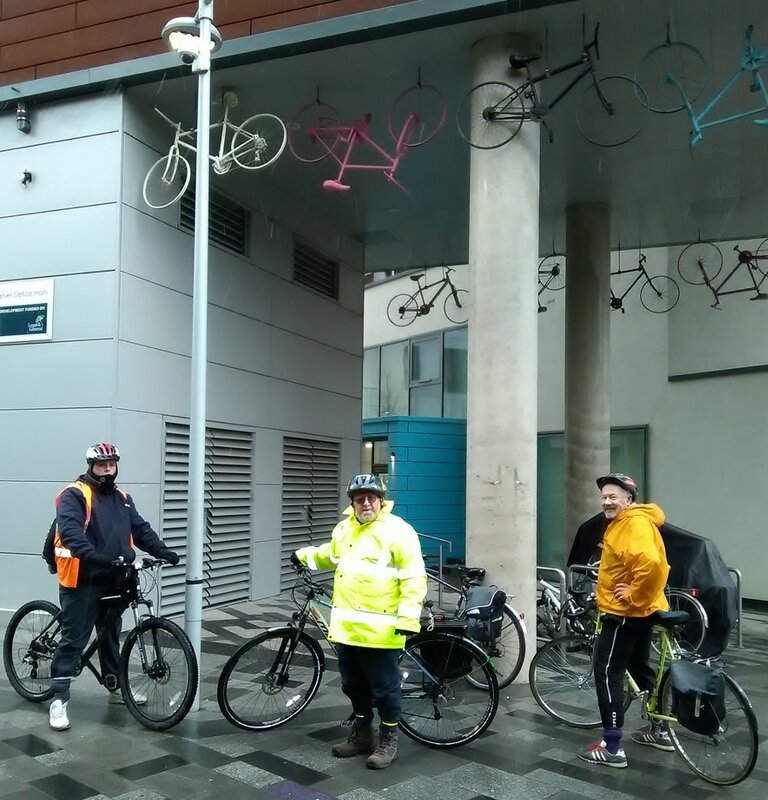 Rain in the air, but 19 riders braved the (quite mild) January weather hoping to burn off some of the excess calories from the seasonal festivities. Early detour from planned route took us into Peckham Rye Park for a "comfort break" at the cafe. This was required as new system at Peckham Pulse meant loos were not accessible any more. First job for post ride to see if this situation can be remedied! Continued up to Telegraph Hill - big disappointment. Light mist completely obscured the normally excellent views north to central London. Down to the Waterlink Way at Brookmill Park, along National Route 21, over Halfpenny Bridge (LCN 2) and on to the Cutty Sark. Brief break there. Back over new swing bridge, then Quietway 1 to Surrey Canal Rd. The stretch from Deptford Church St to Folkstone Gardens has been well done, notably the short segregated track on Edward St. Next the path across Bridgehouse Meadows followed by the awkward crossing of Old Kent Rd to Brimmington Park and quietish roads and path to Peckham Square. 10 miles accomplished comfortably in 2 hours. For route see http://goo.gl/maps/GkEuB.